My Casting Process Up Close – No It Is Not Instant! I have been chatting with several customers lately at events, and it has become painfully obvious that some of them think that the casting process is almost instant, and that the cast pieces arrive looking as lovely as a shiny new penny. I was trying to figure out where they may have gotten this impression from. Maybe they watched an edition of “How It’s Made” where a giant machine spits out polished pieces, or maybe they have seen pewter casting. So I thought about the Pewter Casting for a while. I do a little pewter casting for some of my reproduction spindle whorls. The originals were lead, and I am just NOT going to go there, so I use lead free pewter. I also make a few Pilgrim’s badges in pewter and bronze. Cast Pewter pieces come close to looking like that new penny that we talked about, at least a lot closer than bronze or silver do when they are cast. This picture gives a nice perspective on casting simple pewter pieces. 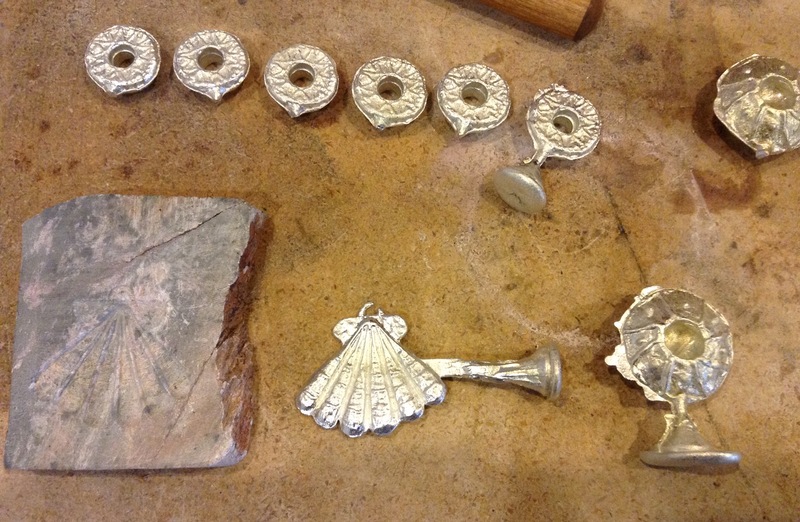 The original soapstone mold that I created for the scallop shell pilgrim’s badge (Santiago de Compostela in Spain), is on the far left. An “almost” cast ( the loop is incomplete and the “wings” on the top of the shell are not squared enough) shows what a fresh casting might look like. Above this is a row of six small spindle whorls, one of which still has it’s sprue intact. The larger spindle whorls on the right side show what flashing looks like (that wobbly bit sticking out on the edge of the spindle whorl). OK, so let’s look at the process objectively. The mold is clamped, and the molten pewter is poured into the mold and allowed to cool. After three or four minutes the cast piece can be taken out of the mold. It will still be hot, especially if it has some bulk, like the spindle whorls do. Depending on the temperature of the room and workbench, a five minute wait is probably a good idea. Then I use a pair of sprue cutters to cut off the sprues. You can see where the sprues have been cut off on both the large and small spindle whorls. I then remove any flashing around the edges of the piece, either with a file, or a wet sanding machine. During this process the remains of the sprue are also removed. I then check any interior “holes”, like the interior of the loop on the scallop and the center hole on the spindle whorls for flashing, and remove it. Now the piece is ready for a quick polish. Twenty minutes in a tumbler with steel shot and burnishing compound will remove any oxides and give the pewter a nice sheen. Shiny! This is what the polished pewter looks like. It is really not a complicated process, but even something as simple as pewter casting is definitely not instant. 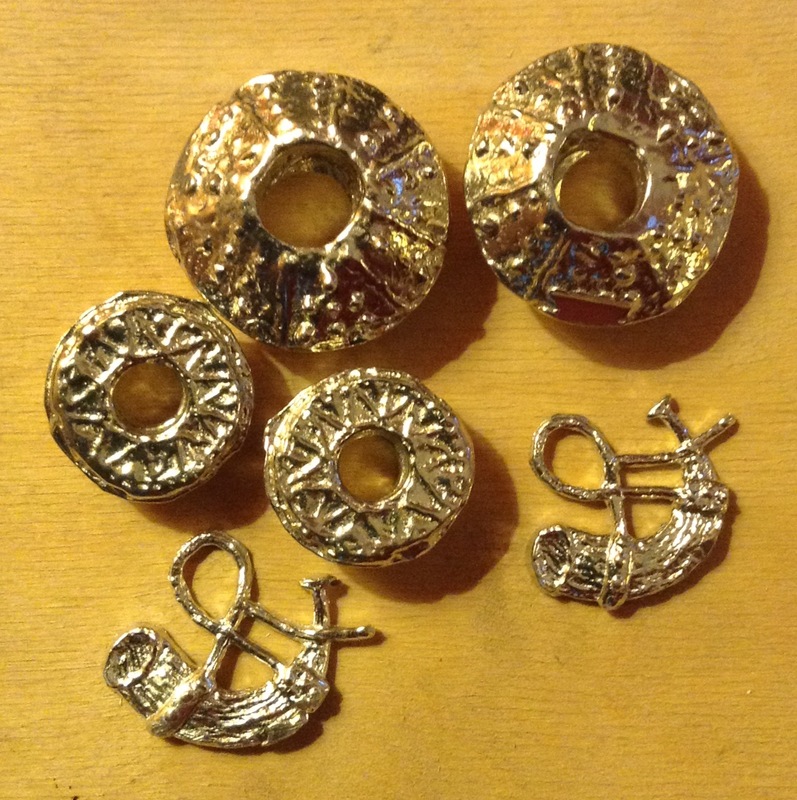 This entry was posted in Metal Casting, SCA Life and tagged Metal casting, pewter casting, pilgrim's badges, spindle whorls by Eirny. Bookmark the permalink.